17-year-old Danish girl charged with planning to bomb two schools in Denmark, including a Jewish one, allegedly was inspired by the terrorist who killed a security guard at a Copenhagen synagogue in 2015. A Danish prosecutor alleged last month that the teen looked up to the 2015 synagogue gunman, Omar El-Hussein, according to the BT newspaper. The girl, who was not named, adopted El-Hussein’s last name on several occasions, telling the court she did so because she thought he was “tough,” according to BT. 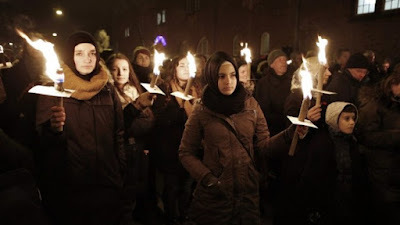 Following a trip to Turkey, the teen became interested in Islam and converted to the religion upon returning to Denmark, according to the prosecutor. She allegedly attempted to get in contact with the Islamic State terrorist group on the internet. The teen was arrested in 2016 for allegedly planning bombing attacks on the Jewish school in Copenhagen and another school in Denmark. She had acquired chemicals to create the explosives, according to Danish prosecutors. In February 2015, El-Hussein killed a Jewish volunteer guard in a shooting attack during a bat mitzvah celebration at the synagogue. El-Hussein was killed in a shootout with police. Abdallah also said that Muslims will soon fight to liberate Jerusalem’s Al-Aqsa mosque “from the filth of the Zionists,” according to the BBC.